Background and objectives: Rituximab (RTX) is one of the biologics available for rheumatologists to treat patients with rheumatoid arthritis (RA). While the reprocessing procedures for other biologic agents are clearly established, this is not the case for RTX. RTX is currently re-administered when clinical relapse occurs (6 to 18 months after initiation of treatment, beyond 24 months for some patients). However, this reprocessing method is not satisfactory because the resumption of symptomatology is generally detected too late. For patients, this delay can lead to increased doses of background and symptomatic treatments, an altered quality of life due to increased pain intensity, joint swelling, nocturnal awakening and morning stiffness and an aggravation of joint destruction. We hypothesize that tight monitoring by a nurse practitioner of RA patients in remission after treatment with RTX is more effective to detect very early relapse of the disease than follow-up exclusively managed by the attending rheumatologist. Design: A prospective, controlled, randomized, open-label, bicentric clinical trial. Methods: Eighty-eight patients with RA in remission receiving RTX treatment are randomly assigned to an observation group or a control group at a 1:1 ratio. In the control group, patients are followed only by the attending rheumatologist every 3 to 4 months according to common practices. In the observation group, patients are subjected to tight monitoring every month by a nurse practitioner in addition to follow-up by the attending rheumatologist. When increased disease activity is observed (disease activity score based on 28 joints (DAS28)-C-reactive protein (CRP) > 2.7), a new cycle of RTX is prescribed by an independent hospital practitioner. Outcome measures: The primary outcome measure is the value of DAS28-CRP at the time of a new cycle of RTX. The secondary outcome measures are the cumulative dose of glucocorticosteroids and/or non-steroidal anti-inflammatory drugs between two cycles of RTX and quality of life questionnaires. Discussion: This study corresponds to the combined management of RA by a nurse practitioner and an attending rheumatologist. A monthly telephone interview conducted by the nurse practitioner enables discussion on all aspects of the disease and regular follow-up to allow frequent readjustments. Thus, patients with good response to RTX treatment at 6 months might benefit from nursing follow-up alone to detect relapse. Such a practice is easily reproducible for RA patients in clinical remission after other treatments. Ethics and dissemination: This trial was approved by the Northwestern France Ethics Committee (approval number: CPP-SC 02/2016) on June 1, 2016. The study protocol is conducted in accordance with the Declaration of Helsinki, formulated by the World Medical Association. Written informed consent is obtained from all participants. Subject recruitment is underway. Data collection began in May 2017 and will end in May 2021. Dissemination plans include presentations at scientific conferences and scientific publications. Trial registration: ClinicalTrials.gov identifier: NCT03027999 on January 23, 2017. Rheumatoid arthritis (RA) is the most common form of chronic inflammatory rheumatism. RA mainly affects small- and medium-sized joints and causes progressive joint destruction with functional, psychological, social and occupational repercussions. Clinically, it results in pain, swelling and tender joints, morning stiffness, night awakenings and significant fatigue. Rituximab (RTX) is one of the biologics available for rheumatologists to treat patients with RA. The schema of administration for RTX is not clearly established unlike other biologic agent. 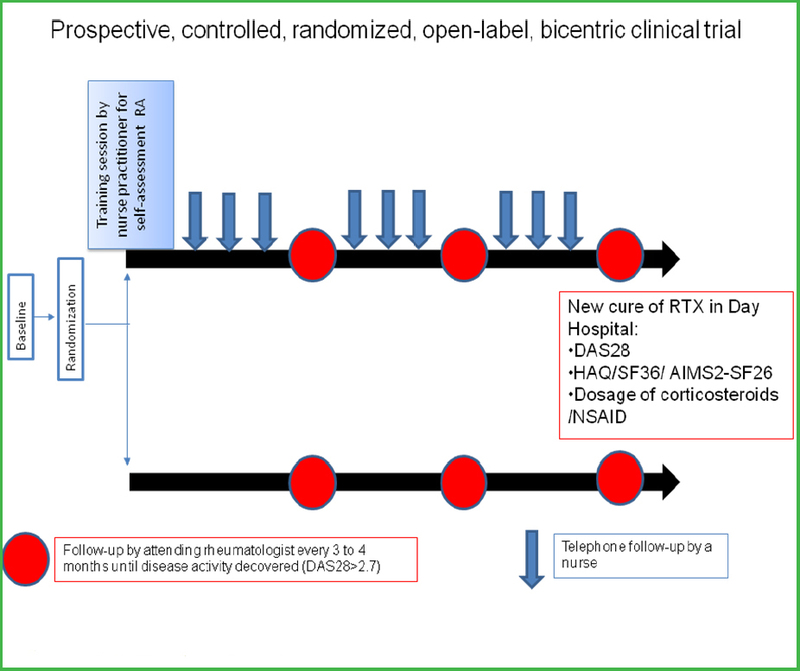 RTX differs from other biologics by a long interval between treatment cures because the selective depletion of CD20+ B cells by RTX results in a longer therapeutic response time. This singularity makes this drug one of the most complex to manage in routine. Indeed, although the European League against Rheumatism (EULAR) recommends evaluation of the therapeutic response from the 16th week, and a minimum interval of 6 months between two treatment cycles, it recommends carrying out new research to establish the optimal treatment strategy. RTX is currently re-administered when clinical relapse occurs (6 to 18 months after initiation of treatment, beyond 24 months for some patients). However, this reprocessing method is not satisfactory because the resumption of symptomatology is generally detected too late. For patients, this delay can lead to increased doses of background and symptomatic treatments (corticosteroids, analgesics and non-steroidal anti-inflammatory drugs (NSAIDs)), with proven potentially harmful side effects (cardiovascular, osteoporosis, etc. ), an altered quality of life due to increased pain intensity, joint swelling, nocturnal awakening and morning stiffness, aggravation of joint destruction. The persistence of RA activity, even moderate, has been shown to be harmful in terms of joint destruction and functional capacity., Therefore, it is essential to identify resumption of RA activity before clinical relapse. A classification of RA activity according to CRP levels has been proposed as follows: high activity if DAS28-CRP ≥ 4.1; moderate activity if DAS28-CRP > 2.7 and < 4.1; low activity if DAS28-CRP ≤ 2.7; remission if DAS28-CRP ≤ 2.3. To demonstrate the efficiency of tight monitoring by a nurse practitioner of RA patients in remission receiving RTX treatment to detect very early relapse of the disease. To demonstrate that tight monitoring by a nurse practitioner of RA patients, with good response to RTX, allows reduction in the number of prescriptions for corticosteroids and/or NSAIDs as a result of new flares of the disease, and an improvement in the quality of life of patients. This is a prospective, controlled, randomized, open-label, bicentric clinical trial. The inclusion period is 24 months. The maximum duration of participation per patient is 24 months. Number of visits per patient: the minimum number of visits expected per arm is 2. Since patients are followed up to clinical relapse, the number of follow-up visits varies among patients. The total research time is 48 months. 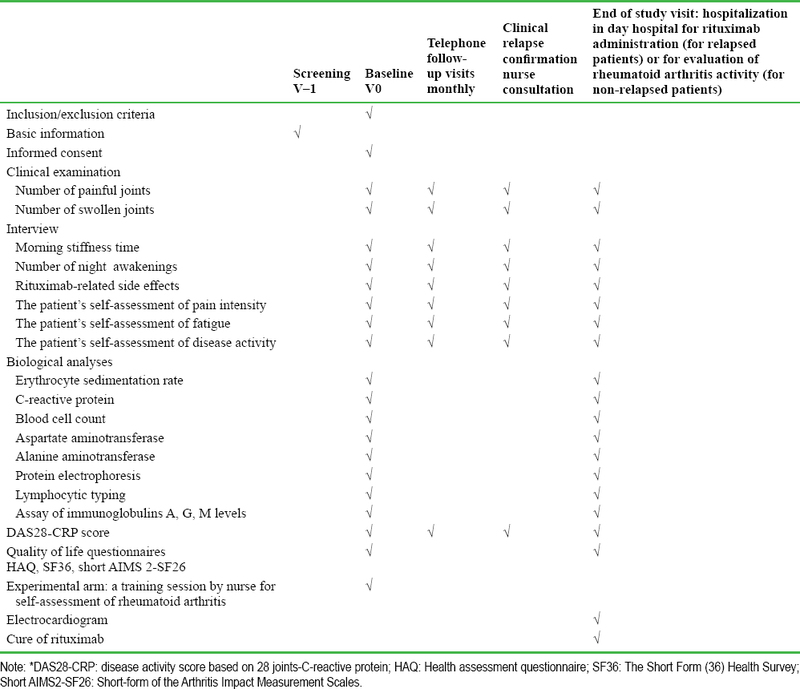 The main findings are reported in [Table 1]. Department of Rheumatology, Rouen University Hospital and Department of Rheumatology, Caen University Hospital, France. 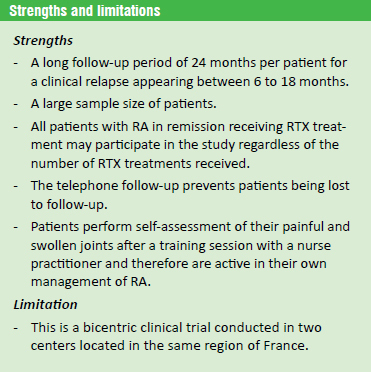 All patients who require treatment with RTX or who have been treated with RTX for less than 6 months receive an information note from the rheumatology departments of Rouen or Caen University Hospitals. All these data allow the physician to evaluate the response to RTX. In case RTX efficacy is not demonstrated by a decrease in RA activity (DAS28-CRP > 2.7), the rheumatologist may decide to refer the patient to day hospital for a new administration of RTX or to switch the biologic agent. In this case, the patient is not eligible for the study. In case RTX efficacy is demonstrated by a decrease in RA activity (DAS28-CRP < 2.7), follow-up visits are scheduled with the attending rheumatologist, every 3 to 4 months, until relapse of the disease; in this case, the patient is eligible for this study. The randomization list by block has been established by the Biostatistics Unit of Rouen University Hospital using SAS 9.3 software (SAS Institute, Cary, NC, USA). This list is then centrally saved and readable by Ennov Clinical software (version 6.2, Ennov, Paris, France). Upon request, the investigator may obtain information on the arm to which the patient has been assigned. This information is sent by the system via e-mail to both the investigator of the center and the study sponsor. A document describing the randomization procedure is kept confidentially within the Biostatistics Unit. Randomization is planned the day the patient is included in the study. The 88 patients who are expected for inclusion are randomly divided into two arms comprising 44 patients in each arm. 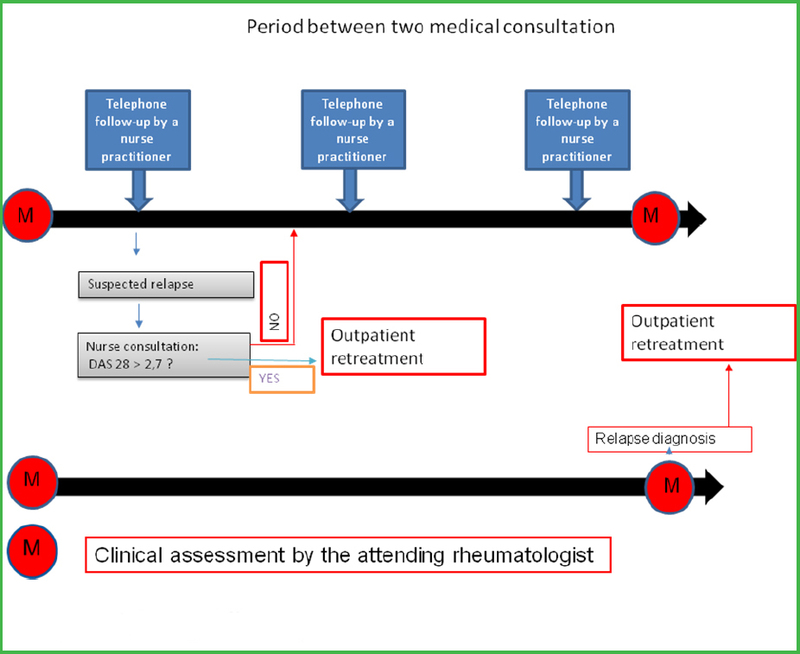 Randomization is carried out to determine the monitoring mode attributed to the patients: either usual follow-up by the attending rheumatologist (arm 1: no intervention), or usual follow-up by the rheumatologist + tight nursing follow-up (arm 2: intervention group). Patients randomized in arm 1 are examined by the attending rheumatologist every 3 to 4 months according to common practices. If the rheumatologist detects more active disease, the patient is referred within 15 days to a hospital practitioner independent from the study to confirm clinical relapse. If the relapse is confirmed (DAS28-CRP > 2.7), the patient receives a new cycle of rituximab. A training session with a nurse practitioner on self- assessing their RA: self-assessment of the number of painful and swollen joints, of pain and disease activity (global assessment by the patient) (self-DAS). During this session, ESR and CRP dosage are planned. A monthly telephone called by a nurse practitioner to collect the results of the patient’s self-assessment. If a relapse of RA is suspected, the nurse practitioner schedules a consultation to confirm the relapse or not. For this purpose, the nurse practitioner calculates the DAS28 taking into account the results of the biological tests, the articular count and the disease activity. Clinical relapse is defined as a DAS28-CRP > 2.7. A new cure of RTX prescribed by a hospital practitioner independent from the study. The study is completed as soon as a hospital practitioner prescribes a new cycle of RTX [Figure 1] and [Figure 2]. Value of DAS28-CRP at the time of a new cycle of RTX prescribed by a physician independent from the study. Statistical analysis will be performed using SAS 9.3 software (SAS Institute). To assess the effectiveness of monthly telephone follow-up of patients, DAS 28 scores will be compared between intervention and non-intervention arms using two-sided non parametric Mann-Whitney U test. A P-value less than 0.05 will be considered statistically significant. In order to achieve 80% power with respect to a 30% difference between two arms, 44 patients will have to be included in each arm, hence 88 patients overall (nQuery 7.0, Statistical Solutions, Cork, Ireland). This trial follows the relevant laws and regulations of the Declaration of Helsinki and Quality Guidelines of the International Conference on Harmonisation (ICH). This study has been approved by the Ethics Committee: the Northwestern France ethics committee (approval number: CPP-SC 02/2016) (Additional file 1 [Additional file 1]). The trial has been submitted to the Advisory Committee on Information Processing in Health Research and was declared to the National Commission on Information and Freedoms. Written informed consent will be obtained from each patient (Additional file 2 [Additional file 2]). The results will be disseminated through national and international journals and conferences. The protocol adheres to the recommendations provided by the SPIRIT 2013 (Additional file 3 [Additional file 3]). All information required by the protocol must be recorded in the (electronic) case report form and an explanation provided for all missing data. Data are collected as they are obtained. Erroneous data in the case report form are corrected by the investigator or the person authorized to make the correction. The traceability of modifications is automatic, via an audit-trail system. All the data are collected in an electronic case report form (quality of life questionnaires, number of painful and swollen joints, value of ESR and CRP, self-assessment of pain intensity, fatigue and disease activity, name and dosage of treatments taken by the patient). The Clinical Research Associate, mandated by the sponsor, will visit each study center on a regular basis after the start of the clinical trial, during the trial according to the rhythm of inclusions and at the end of the trial. The Clinical Research Associate ensures that the rights and safety of the subjects are respected, that the data and information transmitted are reliable, of high quality and traceable, and that the study is conducted in accordance with the protocol, Guideline for Good Clinical Practice of ICH and the regulatory and legislative provisions in force. The purpose of the visits will therefore be to verify and validate patient eligibility: compliance with inclusion and non-inclusion criteria; the adherence to patient information procedures , trial schedule, patient follow-up; quality of data collected in the case report form: accurate, complete and consistent. At the end of each visit, a standardized monitoring report will be written by the Clinical Research Associate which will be reviewed by the promoter. This study corresponds to the combined management of rheumatoid arthritis by a nurse practitioner and an attending rheumatologist. A monthly telephone interview conducted by the nurse practitioner enables discussion on all aspects of the disease experience and regular follow-up allowing frequent readjustments. Thus, patients with good response to RTX treatment at 6 months might benefit from nursing follow-up alone to detect relapse. Such a practice is easily reproducible for RA patients in clinical remission under other treatments. This study was designed in May 2016 and patient recruitment began in May 2017. We are currently recruiting participants at the time of submission. Additional file 1: Ethical Approval Documentation. Additional file 2: Model consent form. Additional file 3: SPIRIT checklist. We would like to thank Prof. Thierry Lequerré (Department of Rheumatology, Rouen University Hospital, France), and Dr Nathalie Léon (Department of Rheumatology, Caen University Hospital, France) for clinical assessment, Prof. Jacques Bénichou (Unit of Biostatistics, Rouen University Hospital, France) for statistical analysis, Nikki Sabourin-Gibbs (Unit of Biostatistics, Rouen University Hospital, France) for editing the manuscript, Isabelle Gorvel (Department of Rheumatology, Rouen University Hospital, France) and Yolande Bataille (Department of Rheumatology, Caen University Hospital, France) for management of nurses, Blandine Laurence, Sophie Baude and Virginie Boucher (Department of Rheumatology, Caen University Hospital, France) for patient follow-up, Vincent Ferranti (Department of Clinical Research, Rouen University Hospital, France) for monitoring the study. Study concept: DL, HB, BG, and OV. Study design and writing: DL, HB, BG, and OV; literature retrieval: HB, DL, BG, and OV; data collection: DL, MG, BG, CM, and OV. All authors approved the final version of this manuscript. This study was supported by French Interregional Group of Clinical Research and Innovation (GIRCI). The funder did not participate in data collection and analysis, manuscript writing or submission. This study protocol was approved by Northwestern France Ethics Committee (approval number: CPP-SC 02/2016), and will be performed in accordance with the Declaration of Helsinki. This study was registered with ClinicalTrials.gov identifier: NCT03027999 on January 23, 2017. The statistical methods of this study were reviewed by the biostatistician of Rouen, University/Hospital in France. We confirm that the data are anonymized. The protocol complies with the MR003 standard, the declaration was made on clinical.Trials.gov respecting these principles. Guillemin F, Saraux A, Guggenbuhl P, et al. Prevalence of rheumatoid arthritis in France: 2001. Ann Rheum Dis. 2005;64:1427-1430. Wendler J, Burmester GR, Sörensen H, et al. Rituximab in patients with rheumatoid arthritis in routine practice (GERINIS): six-year results from a prospective, multicentre, non-interventional study in 2,484 patients. Arthritis Res Ther. 2014;16:R80. Buch MH, Smolen JS, Betteridge N, et al. Updated consensus statement on the use of rituximab in patients with rheumatoid arthritis. Ann Rheum Dis. 2011;70:909-920. Conaghan PG, Hensor EM, Keenan AM, Morgan AW, Emery P, YEAR Consortium. Persistently moderate DAS-28 is not benign: loss of function occurs in early RA despite step-up DMARD therapy. Rheumatology (Oxford). 2010;49:1894-1899. Combe B, Logeart I, Belkacemi MC, et al. Comparison of the long-term outcome for rheumatoid arthritis patients with persistent moderate disease activity or disease remission during the first year after diagnosis: data from the ESPOIR cohort. Ann Rheum Dis. 2015;74:724-729. Trouvin AP, Jacquot S, Grigioni S, et al. Usefulness of monitoring of B cell depletion in rituximab-treated rheumatoid arthritis patients in order to predict clinical relapse: a propective observational study. Clin Exp Immunol. 2015;180:11-18.
van Eijk-Hustings Y, van Tubergen A, Boström C, et al. EULAR recommendations for the role of the nurse in the management of chronic inflammatory arthritis. Ann Rheum Dis. 2012;71:13-19. Gaujoux-Viala C, Mouterde G, Baillet A, et al. Evaluating disease activity in rheumatoid arthritis: which composite index is best? A systematic literature analysis of studies comparing the psychometric properties of the DAS, DAS28, SDAI and CDAI. Joint Bone Spine. 2012;79:149-155. Smolen JS, Breedveld FC, Burmester GR, et al. Treating rheumatoid arthritis to target: 2014 update of the recommendations of an international task force. Ann Rheum Dis. 2016;75:3-15. Anderson J, Caplan L, Yazdany J, et al. Rheumatoid Arthritis Disease Activity Measures: American College of Rheumatology Recommendations for Use in Clinical Practice. Arthritis Care Res (Hoboken). 2012;64:640-647. Prevoo ML, van’t Hof MA, Kuper HH, van Leeuwen MA, van de Putte LB, van Riel PL. Modified disease activity scores that include twenty-eight-joint counts. Development and validation in a prospective longitudinal study of patients with rheumatoid arthritis. Arthritis Rheum.1995;38:44-48. Madsen OR. Is DAS28-CRP with three and four variables interchangeable in individual patients selected for biological treatment in daily clinical practice? Clin Rheumatol. 2011;30:1577-1582. Madsen OR. Agreement between the DAS28-CRP assessed with 3 and 4 variables in patients with rheumatoid arthritis treated with biological agents in the daily clinic. J Rheumatol. 2013;40:379-385.
van Gestel AM, Prevoo ML, van’t Hof MA, van Rijswijk MH, van de Putte LB, van Riel PL. Development and validation of the European League Against Rheumatism response criteria for rheumatoid arthritis. Comparison with the preliminary American College of Rheumatology and the World Health Organization/International League Against Rheumatism Criteria. Arthritis Rheum. 1996;39:34-40. Skogh T, Gustafsson D, Kjellberg M, Husberg M. Twenty eight joint count disease activity score in recent onset rheumatoid arthritis using C reactive protein instead of erythrocyte sedimentation rate. Ann Rheum Dis. 2003;62:681-682. Anderson JK, Zimmerman L, Caplan L, Michaud K. Measures of rheumatoid arthritis disease activity: Patient (PtGA) and Provider (PrGA) Global Assessment of Disease Activity, Disease Activity Score (DAS) and Disease Activity Score with 28-Joint Counts (DAS28), Simplified Disease Activity Index (SDAI), Clinical Disease Activity Index (CDAI), Patient Activity Score (PAS) and Patient Activity Score-II (PASII), Routine Assessment of Patient Index Data (RAPID), Rheumatoid Arthritis Disease Activity Index (RADAI) and Rheumatoid Arthritis Disease Activity Index-5 (RADAI-5), Chronic Arthritis Systemic Index (CASI), Patient-Based Disease Activity Score With ESR (PDAS1) and Patient-Based Disease Activity Score without ESR (PDAS2), and Mean Overall Index for Rheumatoid Arthritis (MOI-RA). Arthritis Care Res (Hoboken). 2011;63:S14-36. Inoue E, Yamanaka H, Hara M, Tomatsu T, Kamatani N. Comparison of Disease Activity Score (DAS)28-erythrocyte sedimentation rate and DAS28-C-reactive protein threshold values. Ann Rheum Dis. 2007;66:407-409. Wells G, Becker JC, Teng J, et al. Validation of the 28-joint Disease Activity Score (DAS28) and European League Against Rheumatism response criteria based on C-reactive protein against disease progression in patients with rheumatoid arthritis, and comparison with the DAS28 based on erythrocyte sedimentation rate. Ann Rheum Dis. 2009;68:954-960. Chan AW, Tetzlaff JM, Altman DG, et al. SPIRIT 2013 Statement: defining standard protocol items for clinical trials. Ann Intern Med. 2013;158:200-207.